There are several marketing mistakes that will mess up your chances of getting your articles published. 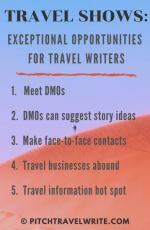 And travel writers just starting out tend to make all of these mistakes. This article is aimed at identifying these errors and giving you some advice about how to avoid them. Of course, mistakes are inevitable when you start something new. It happens to all of us. 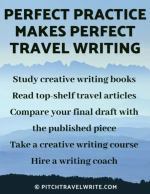 I certainly made lots mistakes when I was getting started in freelance travel writing. And when I coach new travel writers, I see them making the same errors. It’s not hard to understand why this happens. Most advice from experts is outdated and should be disregarded. 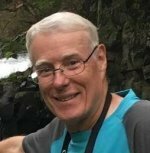 The travel writing landscape has changed significantly in the last several years. A writer who wants to be successful needs to change, too. But there isn’t any reason why new writers can’t immediately adopt some up-to-date marketing practices - as long as you know what practices to follow. One of the most common errors is when a freelance travel writer gets hung up on believing that “one magazine is perfect” for their story. The problem is obvious: when you focus on only one magazine you neglect all the other magazines out there. This is a self-limiting approach. Several years ago I experimented with this "single magazine query" approach. I found that it only results in about a 10% success rate. That’s not very encouraging! I needed to earn some income and this wasn’t the way to do it. It didn’t take long to shift to a more productive querying system. My process is based on sending pitches to multiple magazines all at the same time. This "mass pitching" approach resulted in a much higher success rate. Combined with a few other techniques, it has resulted in a 90% success (publication) rate. I’ve never wavered from this mass querying approach and as of this writing have 1000 published articles in less than ten years. It’s clear that in today's freelance market every freelance writer should be pitching his or her stories to multiple magazines. 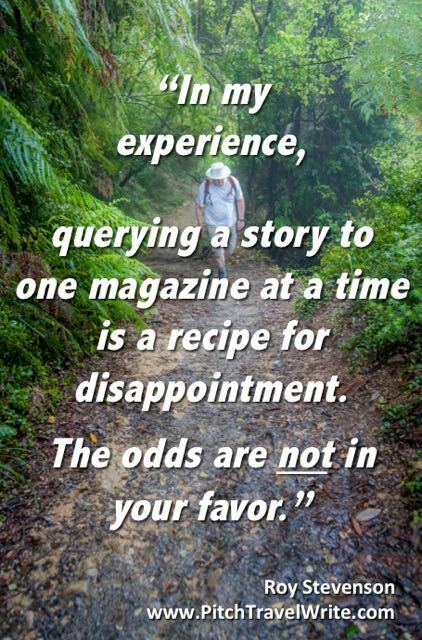 Neophyte travel writers tend to be too selective when preparing a distribution list to query with their story ideas. Instead of finding 25 or more magazines that would be a good fit for their story idea, they compile a list of only a few. I suggest firing out queries to every appropriate regional, state, national, and international magazine. Add to that list any newspapers and specialty magazines and you’ll have a long, robust list. Don’t stop creating your list just because you reach an arbitrary number of magazines. If your list reaches 35 (or more!) viable magazines, then send your query out to them all. Today, it's a matter of using this 'shotgun' approach if you want to sell your stories. And there are plenty of strategies to use if more than one editor is interested in your story idea. Continuing along with the idea that you need to be aggressive in your marketing, some new writers think they can still sell their stories with a half-hearted approach. 2) You send out your query to one magazine on your list and wait to hear back from that editor. When you don’t hear back or receive a rejection, you send your query to the next editor on your list, and so on. Neither of these approaches will help you get published quickly, and the second approach will cause you to abandon all hope of ever getting published. Most editors never bother replying to queries, so sending out query letters by either drip-feed method wastes precious time and energy. The solution is to pitch the whole lot, simultaneously. But that’s not all! You also need to keep the momentum going. Novice writers tend to think they need to share far more information in their query letters than is necessary. For example, many writers think they need to tell the editor this is a simultaneous query. You don’t have to do this. These days most editors know that if they’re receiving a query letter, competing magazines are also receiving the same query. Editors are smart and know the state of things. Sending out simultaneous queries levels the playing field for freelance writers. 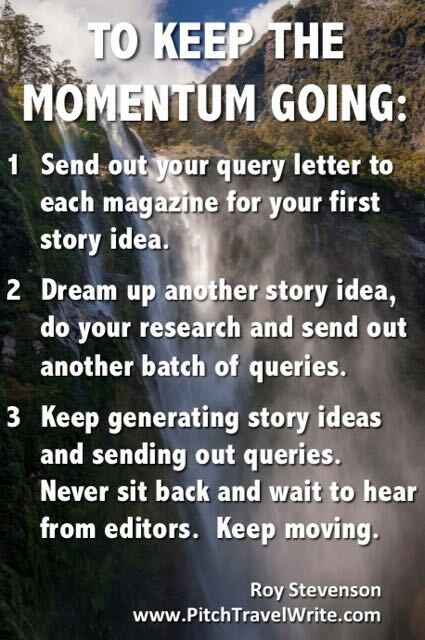 It forces editors to move more quickly when they’re interested in a story idea. It’s also not necessary to tell an editor you don’t have any bylines. 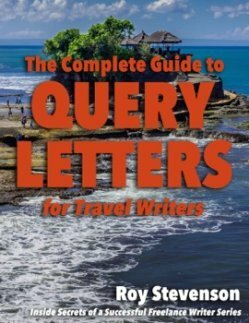 The purpose of a query letter is to entice the editor with a good story idea, and to convince the editor you’re the best person to write the article. If you do a good job of this, it won’t matter if you haven’t been published before. Many writers believe it’s necessary to customize their queries for every publication. It’s not. Send the same generic query out to your entire distribution list. Customizing your query letter for each publication takes a lot of time, especially when you’re playing the numbers game that I recommend. Your time is your most valuable commodity as a freelancer. Don’t waste it. 2) Customize each query with the editor’s name and publication. Beyond that, few changes are needed. A good story is a good story. If it’s a good fit for a magazine and the timing is right, the editor will accept it. This saves you a great deal of time. Just write one solid, generic query using the material you have unearthed during your research. Add any other juicy factoids you can throw into the mix, and fire out the same query to all the editors on your list. I’ve noticed a trend with many writers to bury their pitch halfway through their query letter. This is bad practice because the editor loses interest before he ever gets to your pitch. Front-loading your query letters with superfluous information tells the editor that this is your typical writing style. Editors don’t appreciate this. It tells them they will have a lot of work to do when you submit your article - editing out large chunks of unnecessary verbiage. Editors are busy people. Do whatever you can to save them time. Showcase a clear and concise writing style in your query letter. My advice is to get straight to the point in your query letter with your story angle. Use my Direct Pitch Technique as your query letter strategy. Then add in the “who, what, where, when, and why” of your proposed story in subsequent paragraphs. You’re not in this game to make friends with the editor. It’s a professional business relationship. Don’t bore them with extraneous information. Things have changed radically in freelance writing over the past several years. In order to succeed, you need to shift with the times and defy the old “rules”. Instead, make your own rules. It’s one of the biggest benefits of being a freelancer. Make sure you’re not making these five marketing mistakes by following the tips in this article. Market your stories aggressively and keep your query letters clear, clean and concise. Before long you’ll find yourself selling more articles.